Proud to be Celebrating our 19-Year Online Anniversary in 2015! 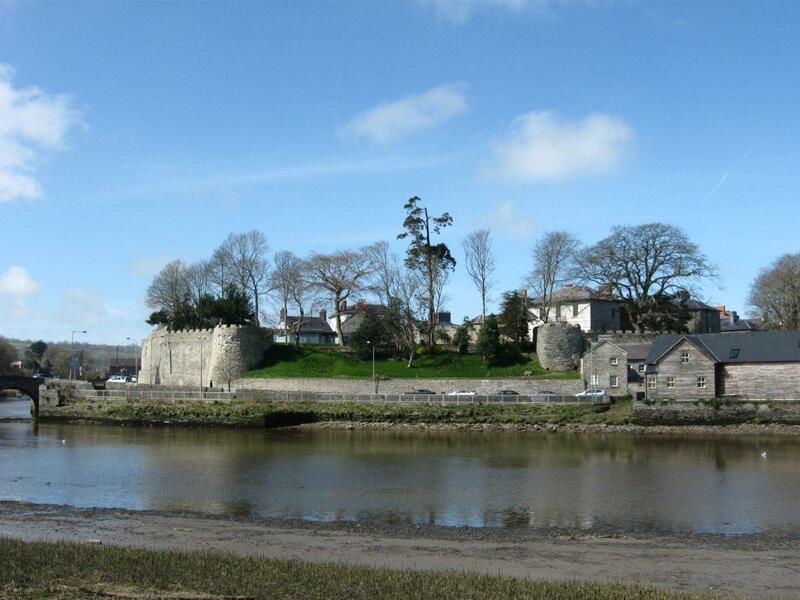 Cardigan Castle stands on the northern bank of the River Teifi in the district of West Wales known as Ceredigion. Although this area of Wales is now relatively quiet it was once on the front line of the struggles between the Welsh and Normans. After Cardigan was captured in 1171 by the Welsh prince of south west Wales, Rhys ap Tewdwr (The Lord Rhys), the castle was rebuilt using stone in a comparatively rudimentary style. Nevertheless, it was good for its day and Rhys was proud enough of the results to hold the first national eisteddfod here in 1176. Welcome! Croeso! My name is Jeffrey L. Thomas and I'm pleased to be your host as we explore some of the most impressive monuments of the Middle Ages, the medieval Castles of Wales. Along the way we hope to educate and enlighten you about not only Welsh castles, but about the unique history of the Welsh people and their centuries-old struggle to preserve their land, their culture, and their ancient language. Wales is often called the "Land of Castles" and rightly so, as it is home to some of Europe's finest surviving examples of medieval castle construction. Over the years I've visited and explored many of the region's famous and lesser-known castles, from mighty Chepstow in southeast Wales, to picturesque Beaumaris on the Isle of Anglesey, and charming Ewloe in the north. The Castles of Wales web site, launched in November of 1995, provides visitors with a lot more than simply a few photographs of the most famous Welsh castles. Our pages cover a wide range of topics related to Welsh castles and Welsh medieval history, and many of our essays are written by today's leading experts in their respective fields of study. We provide information on over 400 different Welsh castles, accompanied by high quality photographs, as well as profiles of the men responsible for their construction and an explanation of the turbulent times in which they lived. Although we provide detailed information and photographs for the most famous Welsh castles, the thing that separates the Castles of Wales web site from other sites on the net is the fact that we also provide large, high quality photographs for many of the lesser-known Welsh castles with less impressive remains. In some instances our photographs of these forgotten castles are the only ones available on the Internet or in mainstream publications. We also feature a smaller section on Welsh Abbeys and Other Religious Sites, monuments that, like the Castles of Wales, represent an important component of Welsh medieval heritage and history. If you take the time to explore the site via the main menu below, we believe you will be pleased with both the variety and depth of information provided. The Castles of Wales survive today in a variety of conditions, ranging from completely ruined to castles that still serve as stately homes for their owners. Many are currently under the care of CADW: Welsh Historic Monuments, an organization whose members are dedicated to preserving the many ancient monuments found throughout the land. So come with us as we travel back in time to discover the Medieval Castles of Wales! Please Note that the Castles of Wales website is a personal project and none of the pages here are an "official site" for any castle. I do not maintain contact information for specific castles, information about the availability of castles for event hire or accommodations, or information regarding the lineage of castle owners. For information regarding the opening hours of a particular castle or books about Welsh castles, please contact the Cadw web site. In addition, our Links page is often helpful in answering certain questions. Thank you. grandeur they are second only to the dramatic landscape." Below is the site's main menu. Begin your castle search by visiting our main castle index, our larger castle database, or enter your search criteria in the site search engine above. For specific essays and other articles concerning the Castles of Wales check out the Historical Essays and Related Essays sections. For additional source materials visit our reference section. The Castles of Wales Website is non-profit, educational resource created, written and maintained by Jeffrey L. Thomas. There are no fees charged for the information provided, however all text and photographs are copyrighted © by the Castles of Wales web site and/or their respective authors and contributors, with all rights reserved. You may follow this link to view a list of other principal contributors, or this link to view comments from other organizations regarding this project.